We are working on some sweeping changes to the basic rules, mostly to simplify and make play in Top Dog more attractive and easy to assume. Stand by for a gentle rewrite of our Rules and Regulations. The rules change that I’m most excited about is removal of the closing date for a posted course or a game. Results will be collected perpetually for any published event. With that in mind, we are going to go back through posted courses since the first moment we launched Top Dog. Some of these have robust results… and some are orphans. This also means, you should know, that any player can call for an immediate “Mulligans” or a do-over. Both runs/attempts, should be reported in results. This is a dramatic departure from the way nearly any agility organization in the world operates. Who is to say that the “standard” is actually the best rational standard? All systems of rules at their core are irrational. We will observe our own standard of the irrational. I wrote about today’s posted rerun in my personal blog: http://wp.me/pmSZZ-19L. This is: 113012A86x98. 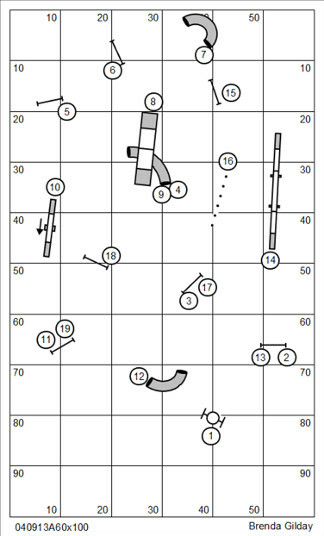 Click to download the score sheet (complete with course maps for CRCD). 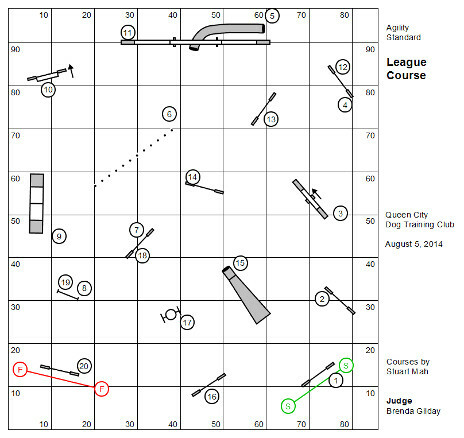 This course is both the oldest and the latest course challenge for Top Dog Agility. We’ve had a subtle rules change that allows re-running of any course. What it really means is that a course or game never “closes” but is left open like the high scores on a video game at the arcade where everybody has a shot at getting to Top Dog. In consultation with the Top Dog Steering Committee we are introducing a few changes to the format. These really aren’t small changes. So try to follow along. All events will be permanently open. Results for each event will be maintained on a historical basis. Therefore, all closing dates documented for events are no longer in effect; (give me time, and I’ll remove all of them). A dog may repeat a course or game; and each score recorded individually. The repeated run may be on the same day… or at any later date. Titles will be normalized to reflect systems used by other agility organizations. The rules need to be edited to reflect these changes. We begin July with two numbered courses. 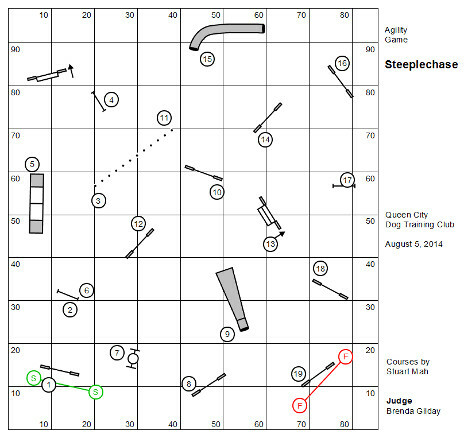 Please note that the second is a Jumpers course. Because it is not a game… it becomes a numbered course. I am excited about the start of the New Year as we begin the marketing of Top Dog Agility Players in earnest. Top Dog is intended to be a truly recreational venue. As such TDAP should not be compared to any of the training venues that all subscribe to essentially the same model of progression and distinction. While we aspire to eventually have our own world championship tournament, right now we modestly aim at growing participation and figuring out the complicated logistics of a competition that is conducted in more than one physical place. I have agonized for some time over the issue of jump heights, especially. Mind you that I’m an old timer. My first agility dog, Winston the Wonder Dog, was 13″ tall and had to jump 18″ (back in the day) to earn his ADCh title in the USDAA. And big dogs actually jumped 30″ in those days. In any case, all jump heights are arbitrary and by some measure or another irrational. We began our definition in the rules by establishing jump heights, and then providing for Jump Height Exemptions for long aback dogs, dogs with dwarfish legs, and so forth. But the more I thought about it the more I was convinced that there are any number of reasons a handler/owner might want to jump his dog at a lower height. Giant breeds, for example, might deserve a lower jump height; or the handler might have a dog that is convalescing from some injury; or who knows… I don’t really care to explore the entire psychology of jumping at a lower height. Jump heights are determined based on the height of the dog at the withers. It is the responsibility of the judge appointed by the host club to measure and determine the correct scoring jump heights for all dogs in competition. The score sheet for an event shall contain two important indicators: 1) Jump Height; and 2) Scoring Jump Height. A dog may jump at any jump height the owner/handler desires. Jump height exemptions are self-declared. A dog may be jumped at a lower height for any number of reasons (the dog is slightly lame; the surface is not optimal for jumping at full height; the dog is a non‑confident jumper). Top Dog Agility Players will not monitor dogs’ jump heights in league competition. Dogs with a jump height exemption jump at their exempt height but are scored with dogs in their measured height (Scoring Jump Height). Please note that a dog can jump at any height greater than his measured height if desired. This includes 24″ and 26″ jump heights. Scoring Jump Height is the measured height; the height at which the dog would jump if no jump height exemption whatsoever is extended. Jump Height is the exempt height; the height at which the dog actually competes. 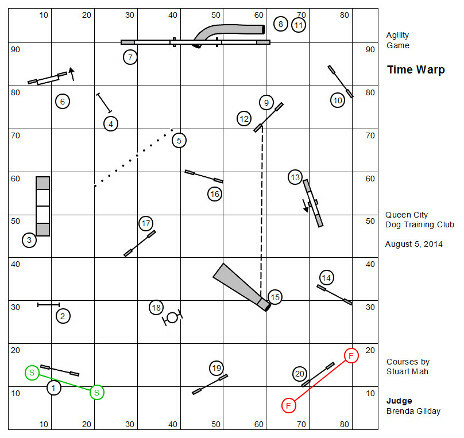 This is a numbered course, judged under TDAP rules. Competition shall be conducted by a judge and stewards appointed for specific tasks in conduct of the event. No certification process exists for judges. TDAP will rely on good sense in the selection of experienced persons to perform this task. A judge is initially registered with TDAP upon submitted event results. The judge or appointed stewards shall observe and signal course or game faults or points. The judge alone will sign off on competition results. The Event Closing Date January 25, 2013. 010413A60x85 ~ A numbered course for an 60′ x 85′ space. Each of these are numbered courses, judged under TDAP rules. The Event Closing Date, for each, is January 4, 2013. 121412A86x98 ~ A numbered course for an 86′ x 98′ space. I had a bit of fun with this design. 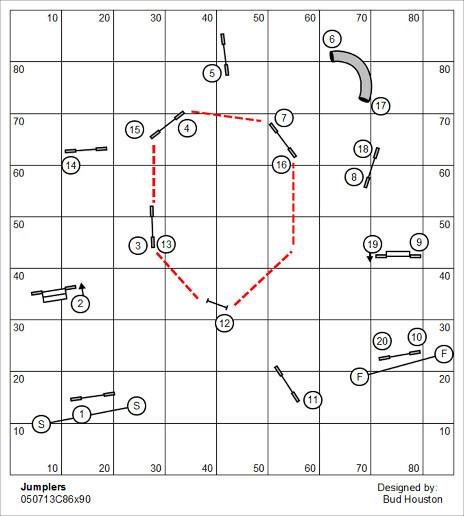 The rule of thumb in the design of “standard” courses is to play down the use of tunnels so that the tunnels don’t dominate play. It’s very difficult to fault a tunnel; and under Top Dog rules the pipe tunnel isn’t even an obstacle on which the dog can earn a refusal. What I’m really looking for here is the handler’s keenness for demonstrating the direction of turn both getting to the pipe tunnel, and on the dismount. It’s not really quite as simple a matter as it would seem. 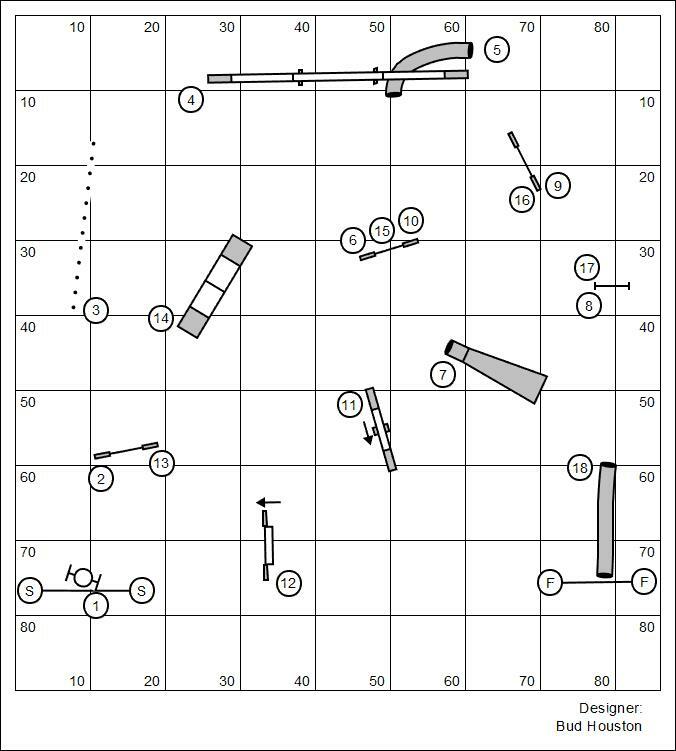 121412B60x90 ~ A numbered course for a 60′ x 90′ space. 121412C50x80 ~ A numbered course for a 50′ x 80′ space. Well, these are gnarly issues. Rather than arguing or advocating one way or another I’ll have to refer you to Rule 8. I’m sorry to say that I did not post the following courses on the Top Dog Agility Players blog. I wrote the blog-post and entered it but left it in draft form through the week. So nobody actually got to see it. I’ve made a note to be more careful. Maybe I should nudge that up to the status of a New Year’s resolution? The Event Closing Date, for each, is December 28, 2012. 120712A40x60 ~ A numbered course for a 40′ x 60′ space. 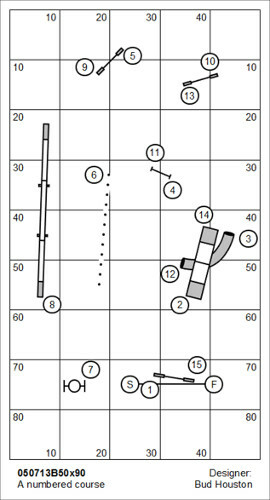 If you think about it, this is a Jumpers with Weaves course played in a 40′ x 60′ space. It was a lot of fun to design (and to play, by the way). The real challenge was to keep the spacing big and safe with intervals in the 20′ range. The secret to designing for a small space is in the repetition of obstacles. A little experience with the course urges me to point out that the course is easier to memorize than it appears at first glance. 120712B60x80 ~ A numbered course for a 60′ x 80′ space. This is a fun little course. 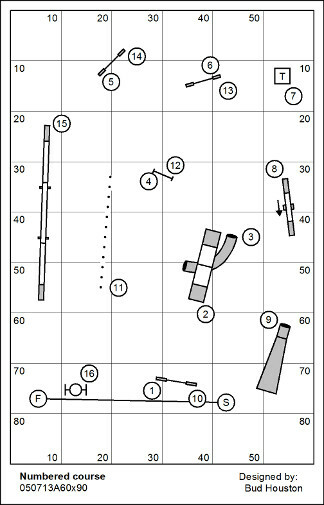 The really wicked moment is in the turn to the weave poles after jump #10. A dog is faulted for a missed entry to the weave poles under TDAP rules. You’ll note that the set of equipment for the 40′ x 60′ course (above) is a feature of this course… everything exactly placed. 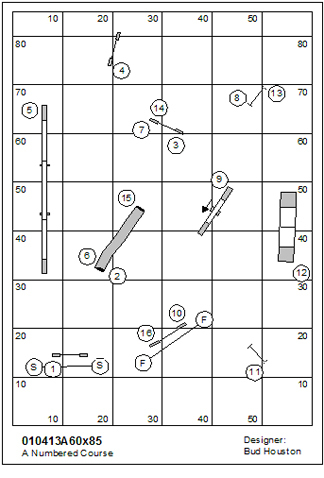 Please note that if you are running both numbered courses it is allowable to bend the #2 pipe tunnel out of the way, and to move the #1/#15 jump so that the 40′ x 60′ course (above) can be run as intended. 120712C70x70 ~ A numbered course for a 70′ x 70′ space. Flavor: Played under the rules of the Teacup Dogs Agility Association (TDAA). 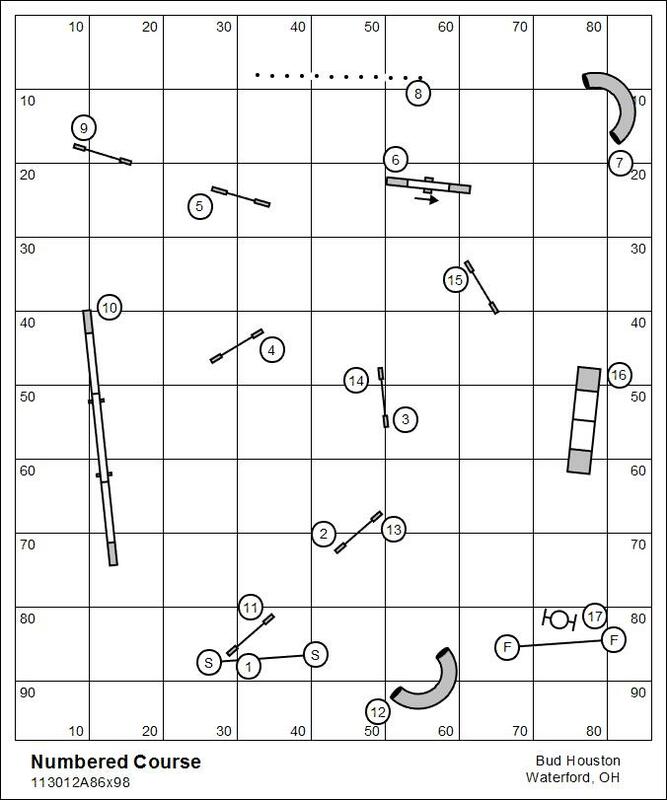 Historical Footnote: This was the first standard course played at the TDAA Petit Prix Eastern Regional in Latrobe, PA on October 26, 2012. The dogs that played on that day will be included in the event results. We intend to feature most of the courses played at the TDAA Petit Prix over the next couple of months. This will allow you to have a play in the Petit Prix and see how you would do against the dogs who were in attendance. Watching the growth of the Top Dog Agility Players is like watching grass grow. Oh, and it’s winter now, so grass doesn’t grow at all. No worries. This is exactly as I expected it to go. Not very many people yet know the venue exists. And since we don’t have data systems in place yet, minimizing data entry is a blessing. We are contemplating a change to the rules that waives the jump height requirement altogether. There are a number of reasons that a person might decide to jump his dog at a lower height than the traditional agility organization would insist the dog jump. Not a lot of people would jump a dog at a lower height purely to gain a competitive advantage in recreational league play. As I struggle through the wording of the rules I’ll probably post back to the blog for comment.